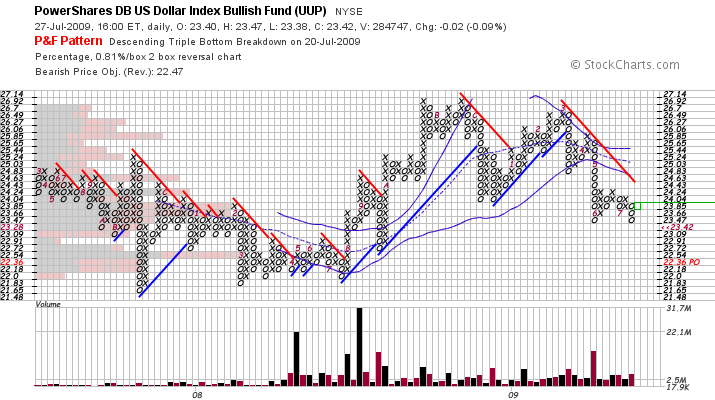 The USD has fallen over 10% since March, stirring up inflationistas and fueling the bull market. Since the beginning of May, the dollar has traded in a downtrend below a descending lower Bollinger band, forming a descending triple bottom on July 20th. While it seems unlikely that the Federal Reserve will raise interest rates due to 9.5% unemployment, a dollar crisis could change the tone of Fed policy. Whether helicopter Ben has the cajones to raise the risk free rate remains to be seen, the political will for such a measure seems unlikely given the present administration. With a current bearish price objective of 22.36 based the width of the triple bottom, there is no apparent reason to be long UUP unless it can recapture 24.24.